There are 6 reviews so far. To add a review of your own for this item, visit the voting page. This book was a good depiction of a Tom Baker Dr. Who story. I thoroughly enjoyed this, especially the build up of suspense. There were, however, a couple of drawbacks to the storyline: the way the creature was explained was done rather haphazardly with not much description, and leela didn't really have much of an active part as her character did in the television program. leela's pairing up with kristal was a good idea, but they should have fed off of each other instead of leela just following kristal around. they were a perfect match but the relationship didn't seem all the strong in the story. The Good: The Doctor talks circles around high-ranking military officials and CIA agents. The Bad: Although the atmosphere is great, the running around bits are a tad confusing. The Ugly: It's the first time I've seen colourful language in Dr. Who ... and I didn't mind it! The book begins quite slowly, introducing us to an almost dizzynig number of characters and situations. Stick with it though, as slowly but surely the book brings the characters and situations together until suddenly it accelerates. If this had been a broadcast story, episode 1 would have been plodding, episode 2 slightly less plodding, episode 3 would have seen the pace pick up and episode 4 would have been a rollercoaster ride. The book has a number of plus points, the main one being the interesting foe that the Doctor ultimately has to deal with. As I said, the pace of the final half of the book really picks up and draws the reader in - so stay with it. On the negative side - Leela is not well utilised, she spends more time admiring the skills of a Native American tracker than actually doing anything herself; the ending seems rushed and confusing; and the range of characters and situations take too long to converge, sometimes they seem to peter out before we get to the convergence. However, the pluses outweight the minuses and this is one of the best DW novels I have read in a while. I look foward to reading Simon Forward's other novels for the series. Unfortunately, I liked like this book. That means I'll either sound or feel bad about criticising it. It had a brilliant concept, a brilliant creature (described brilliantly), but only seen on one or two pages. The characters were (althouh good ideas) were described foggily, the events didn't make any logical pattern (except for one or two), and we're still wondering what the hell is going on, and what are people doing. Caught up with lengthy depictions of people travelling, personal struggles, this story ends up like an American show about the government and CIA and top secret info, except without all the excitement. BUT because of sheer stubborness, I continued through with this novel. And hey! it was brilliant. It is only at the end does it pull itself together and pull out a brilliant show. The alien creature is just vivid in some descriptions, and some of the metaphors or sentences the author uses to describe something give them life. In the end, it is saved by fantastic ideas, but is dragged a bit back by a long storytelling. If it had been shorter, this would have been one of my most favourite stories. And I regret writing this because the bad things stand out more than how much (no matter how much I write them) I liked this novel. It just could have been a *bit* better. P.S. I liked the Doctor getting drunk, though. I predict a storm... anyway, it is one of the better books. It might not be, but reading the adventuress of Henrietta street interfeared with my wiring... Forget that. Read it... if you want. "Drift" is a peculiar novel in its mix of good and bad parts. Taking place in New Hampshire on Thanksgiving day sometime around the year 2000, the story places the characters inside a monster snowstorm that contains a monster. The backstory of the main plot comes along in drips and drabs, but basically runs like this. Thirty years prior, a spaceship crashed in the New Hampshire backwoods, dumping an alien couple, male and female and human in every way down to sensitive male parts, on Earth. The few pieces of the crashed ship became the focus point for a Heaven's Gate type alien worshiping cult who set up in an abandoned house nearby. Flash forward thirty years and the military are secretly testing another captured alien device in an airplane. The plane crashes near the previous crash. Unknown to the military, who believe the alien device is a means to manipulate the weather psychically, the device is actually a multi-dimensional navigational instrument that folds dimensions. The weather control is just a side effect. The device has opened a dimension and let in an other-dimensional animal that takes the form of snow crystals arranged like a nervous system. Seeking minds to commune with, the snow creature latches onto humans and destroys them. Into this mix there are several groups to contend with. First, we have The Doctor and Leela, out in the wilderness because The Doctor has forgotten where the TARDIS is. We have the remains of the cultists, most of whom were destroyed when the cult recovered the dimensional drive and opened the portal for the creature. We have the Air Force team sent to recover the device, led by Captain Shaw, who grew up in the town where all this occurs. We have the townspeople, mostly represented by Shaw's older brother, Mackenzie, the local police chief, and his roughly joined family - a woman wronged by her no good first husband and her moody teenage daughter. Most of the novel is concerned with people lost in the snow, getting picked off one by one by the snow creature. There's plenty of family angst as Mackenzie seems to be the good man always doing the wrong thing, disaffected from his brother and barely holding it together with his makeshift family. Most of the early part of the novel is needlessly difficult to get through as the reader gets introduced to several characters, one after the other, with dizzying speed. It becomes particularly hard to keep track of all the military people, even when Forward gives them all unusual names in what seems to be an overdone attempt at American pluralism. The one part of the novel that stood out to me as "what is this all about?" concerns the remainder of the cult. They are down to three, the leader, his "girlfriend," and a follower, a former thief. The leader lasts for just a couple of chapters. Seeing the device wipe all of his followers from existence drives him over the edge and he gets left behind to die in the snow. The real headscratcher is the girlfriend, Emilie Jacks. She is former military, a tough guy in a woman's body, all muscle and kill instinct. She decides for no particular reason that with the cult done, she must destroy the cult house, beat up or kill everyone who stands in her way, take a hostage, beat her up, kill some more, and abandon her dying cult-mate. Why she does this, what she hopes to accomplish, and why Forward spends so much time on it in the novel never becomes clear. This whole sequence drags the plot rather than progressing it. Another questionable aspect that pops up in other Simon Forward works, such as the Big Finish drama "Dreamtime," is the portrayal of aboriginals, a Native American in this case, as having native psychic powers because they are somehow more in tune with the natural world. This bizarre romanticizing of native peoples is just annoying. Also, everyone wants to drive around in a zero-visibility snowstorm, which seems to be mostly a convenient way for the writer to get the characters separated from each other and thus easier to pick off. The good parts of the novel are these. It is one of the few Doctor 4 novels that doesn't play The Doctor as all whimsical, scatterbrained, and nonsensical. This Doctor is close to how he was in 1975-6. Leela, too, is portrayed fairly well, not just as a superstitious primitive. 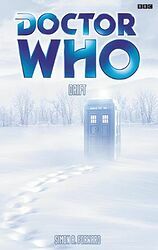 The Doctor is not a crusader in this novel, just a guy in the wrong place at the wrong time who realizes he is the only one with the knowledge to rescue the situation. The writing is brisk, without stylistic overkill. The alien menace is interestingly different and believable because the menace is purely accidental. This last aspect is probably the best reason to read "Drift."